Sometimes I use the paper and ribbon that I have hoarded. 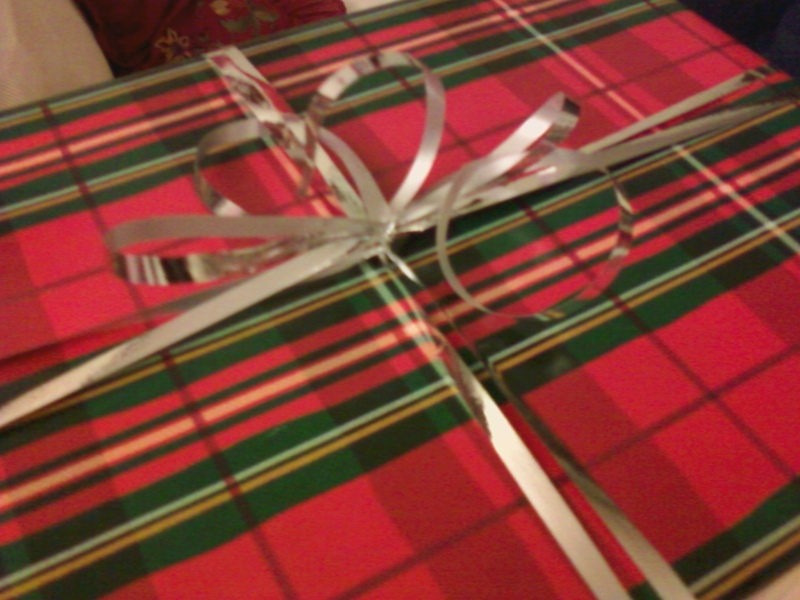 You probably can’t tell, but that is just a simple bow tied on top of a present. This is my default way to embellish a present. I tie up the box twice for extra oomph and then tie a bow. Sometimes, I add an ornament or two or a 3D sticker depending on my mood. I layered two different types of ribbon to create this look. 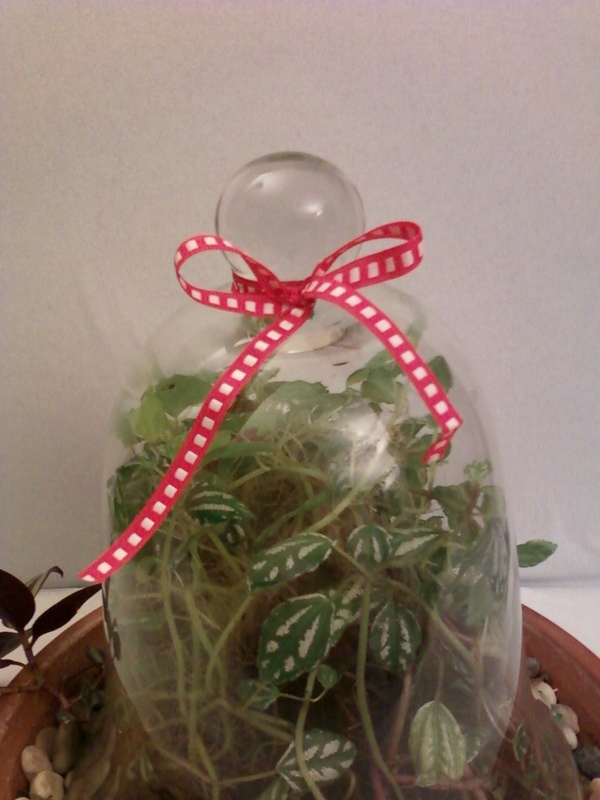 The best part about this is that I used ribbon scraps. I have a habit of hoarding storing extra bits of ribbon that I come across. 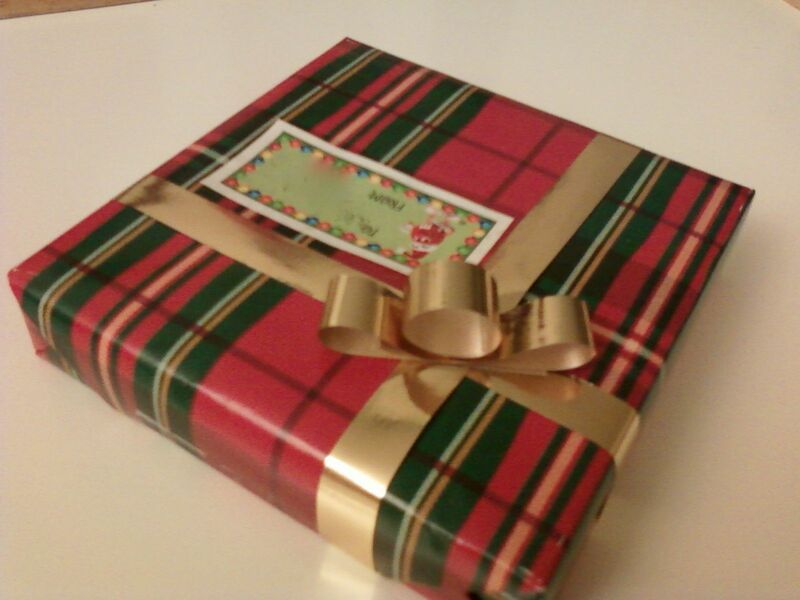 I taped the ends of the wider ribbon at the bottom of the box. 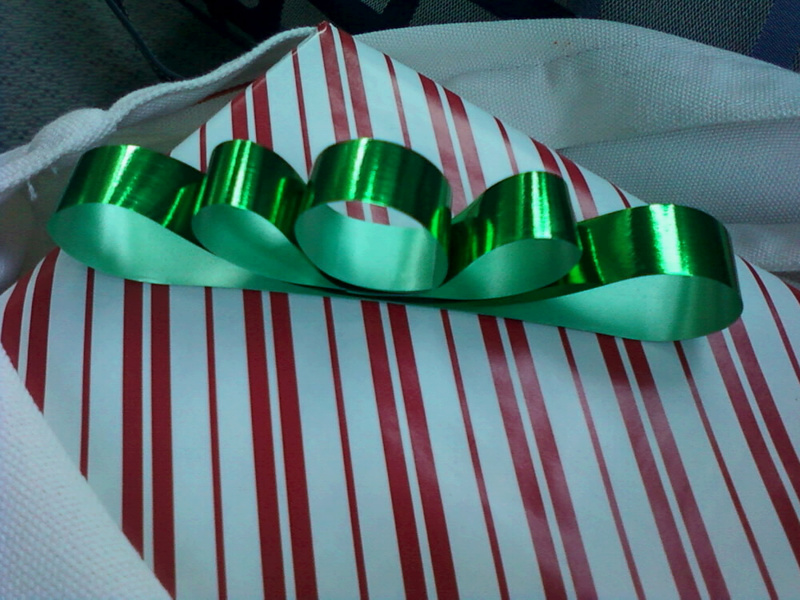 Then I knotted the curling ribbon on top. I also trimmed the ends so I could add it back on and have four curly ends instead of just two. 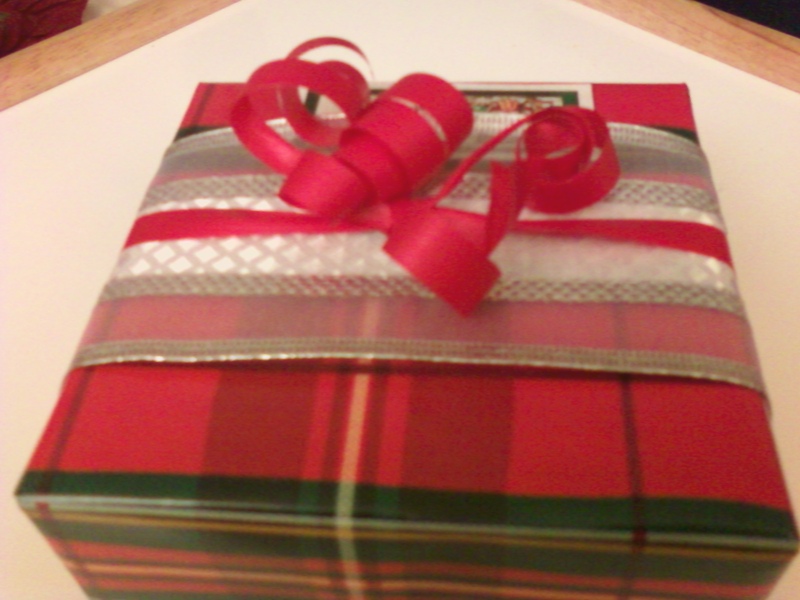 The bottom layer doesn’t lay flat on the package due to the wire edges, so a less stiff ribbon will be flatter I think. 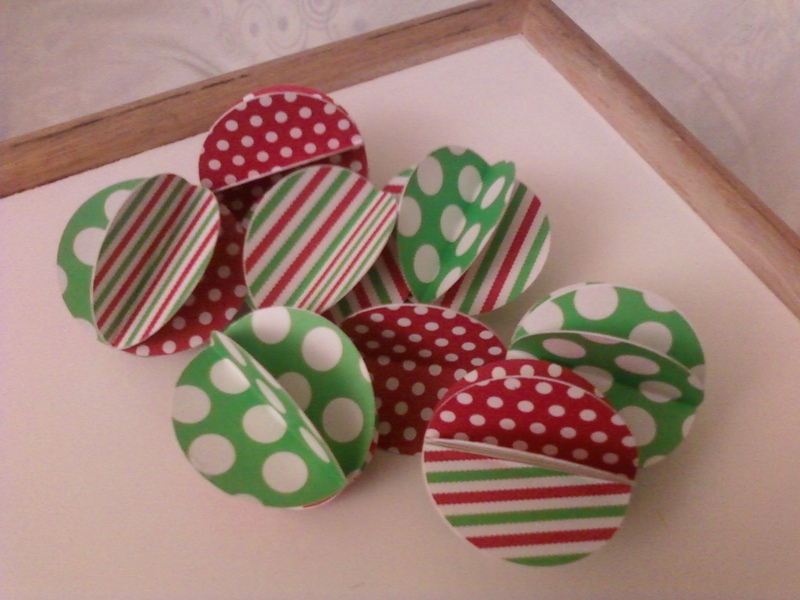 I could have also glued the edges down too – but then that means the ribbon can’t be reused. Alternatively, a non-curling ribbon could be used for the second layer and just tied into a bow. Here’s a simple bow that adds a lot of flair. It’s really made up up two parts: the circular loop that goes on top, and the flattened loop that goes on the bottom. I used double-sided tape to make the initial circular loop. I made the diameter to be less than an inch because this was a small present. An added bonus to using double-sided tape (instead of a stapler) is that you don’t see the staples, so it looks cleaner and prettier. Here’s a version with three loops – I just added a longer third loop to the mix. 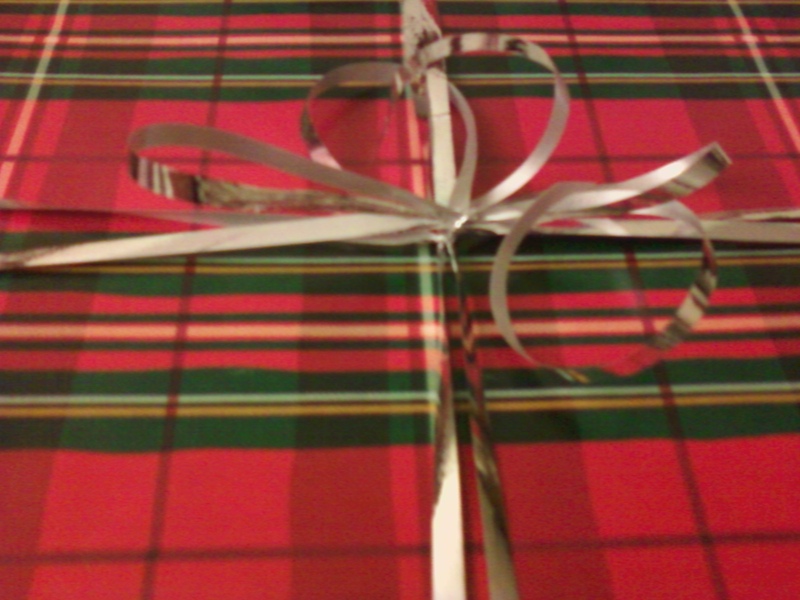 Tomorrow, a post on adding bows to presents! Other than increasing the size of my stash, I haven’t done anything with ribbon lately. 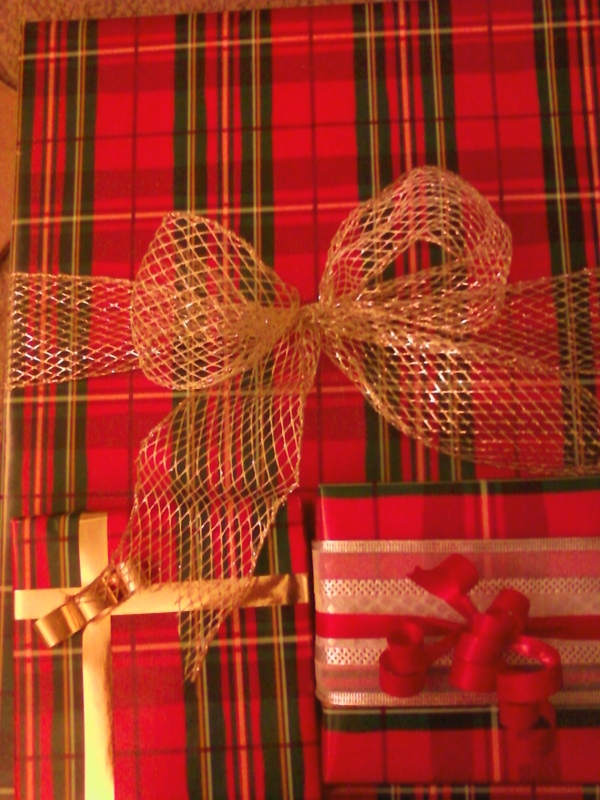 Here is my paltry attempt at Christmas decor using ribbon. I don’t even know what the thought process was on this one. I didn’t even bother to trim the folded-over end. Also, I didn’t bother to tie a proper bow. I am all “whatevs” about this though – which is not normal. Normal me would have fixed the problem. I’d like to think that I am just saving up my creativity for wrapping presents. But really, it’s probably my self-diagnosed ADD kicking in. 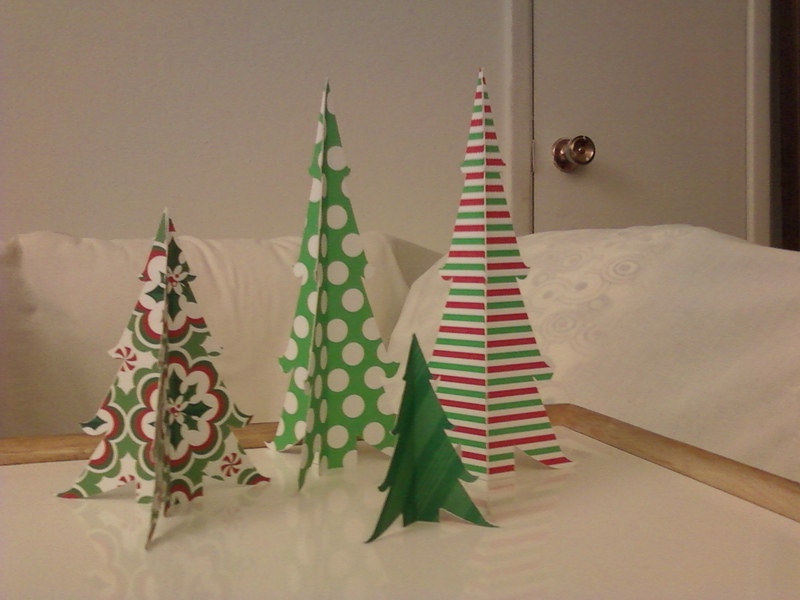 Here is a quartet of self-standing Christmas trees. I came up with the idea of making trees that stood up by themselves while I was out having dinner with my boyfriend. He was very skeptical of my idea, but he semi-grudgingly agreed to help me. After a few weeks of waiting and with some gentle prodding and maybe some “why won’t you help meeee” whining, I got my tree! When I cut it out, I realized I should have also addressed aspect ratio in the design phase to maximize paper space, or to lessen wasted paper when cutting. But then I realized that not all my trees have to be in the same proportions – I can make skinnier or fatter trees! Three tree shapes make up one tree, fold in half, glue the backs together and the branches will fan out by themselves. I’ve found that it’s best to line up the tips of the branches first before aligning the trunks. I was going to post this tree shape file here, but then I realize it isn’t in printer-friendly format. I’ll have to convert it into an outline first. Which really means I need to ask/bribe the bf to do it for me – but he may not want to help me out because we have a dispute about who designed this tree. He claims he designed it. I claim it was MY idea and he executed it. Here is my attempt at a tutorial for the 3D paper ball in my previous post. I’ve noticed that “connect the pieces using the slits until you get a ball” is not enough information. It takes twelve pieces to make one ball. I like to think of it as as two end pieces, and the remaining pieces make two “rows” of five pieces each. Take one piece and insert five other pieces into the slits of this first piece. Connect the five pieces to each other. At this point you should have something that resembles a cup. Repeat steps one and two. Now you should have two cups. The open end of each cup should have ten open slits. The tricky part is to make sure each half is offset by one slit when you put them together. So basically, match up the “edge” with a flat part on the other half. It will get a little awkward as you keep going, don’t pull too hard or you’ll tear the paper. You may want to gently pull the slits together, to make the ball rounder. I’ve noticed that when I use smaller pieces, it is a little bit harder to make the ball. The paper just isn’t as flexible. I haven’t tried to make these using cardstock, but I am guessing it might be better to cut out larger pieces. Et voila! You have a 3D paper ball. Remember how I said this pair of balls needed a third one? Well, I added one using How About Orange‘s paper ball template. The diameter is maybe six inches across. This was really fun and easy to make, mostly because I made my Cricut do all the work. It takes twelve pieces to make one ball. 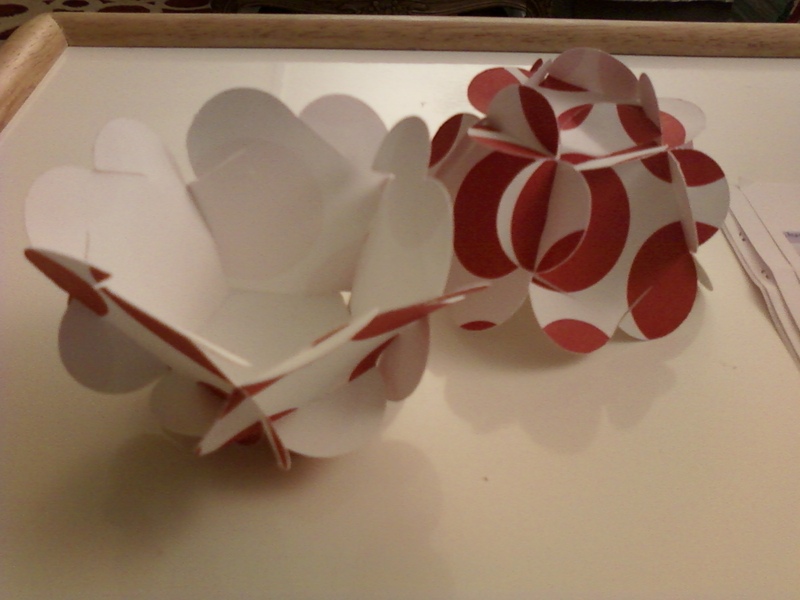 I am pretty sure that if I had to cut them out myself, I wouldn’t have cut enough pieces to form a ball. Here’s a smaller one. This one fits on the palm of my hand. I think it looks better with a busier pattern. What do you think? 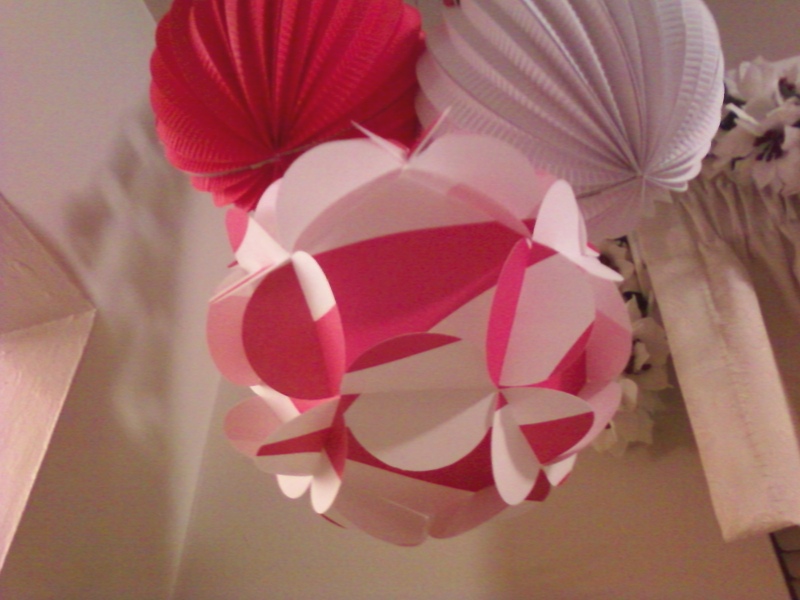 I made some paper balls. I thought these would look cute in a bowl. I stopped cutting at 45 circles because I felt like that was too many, but I think I need to make at least triple that amount to have any sort of decorative impact. Or maybe just find a smaller bowl. Or make bigger circles. Or use different paper. These were ridiculously easy to make. I cut out 2″ circles using my Cricut. Then I used the raised corners of my scoreboard to use as a placement guide, then scored along the 1″ line. So I really don’t have a good reason for whining about having to make more. 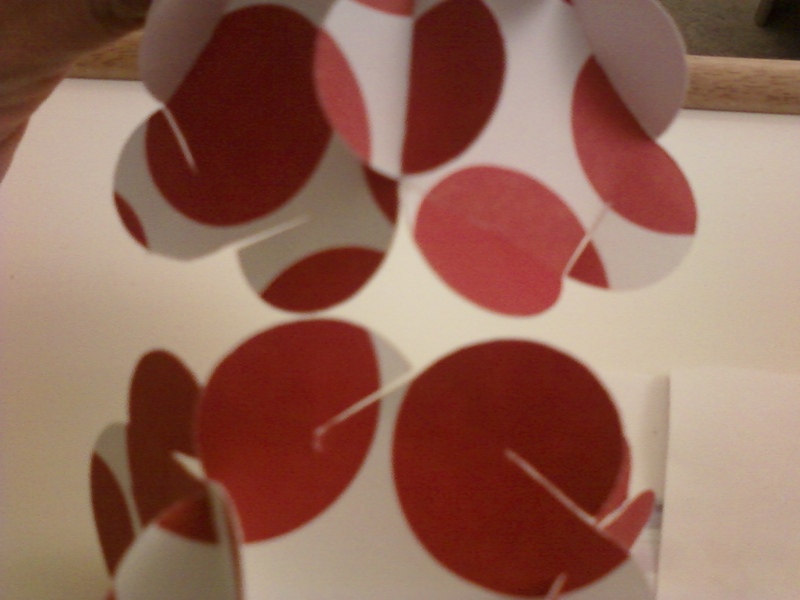 Actually, the original plan was to glue the balls on red ribbon as I made them to make a drape-y festive garland. But at 11pm last night, I just didn’t feel like looking for ribbon. Plus I wasn’t sure if my no-paper-wrinkles glue stick would work. 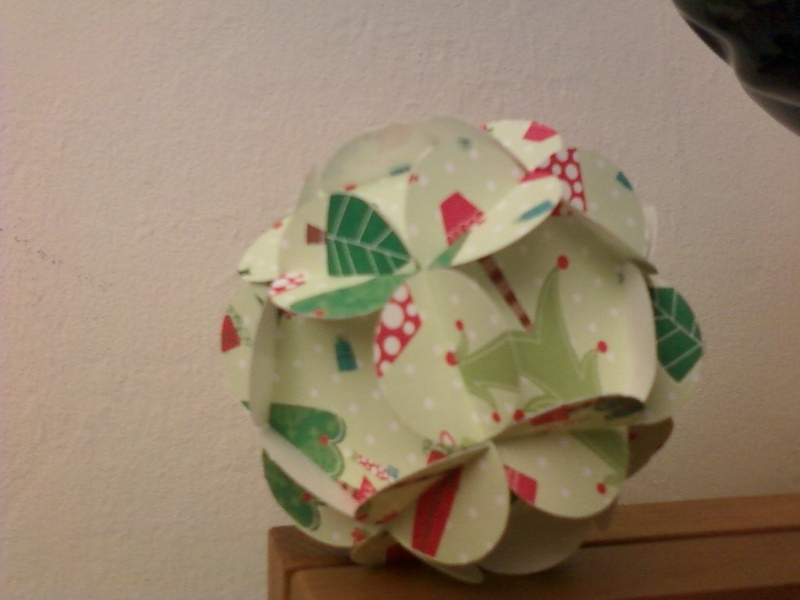 I did leave space at the center of each ball so I can thread ribbon through later. 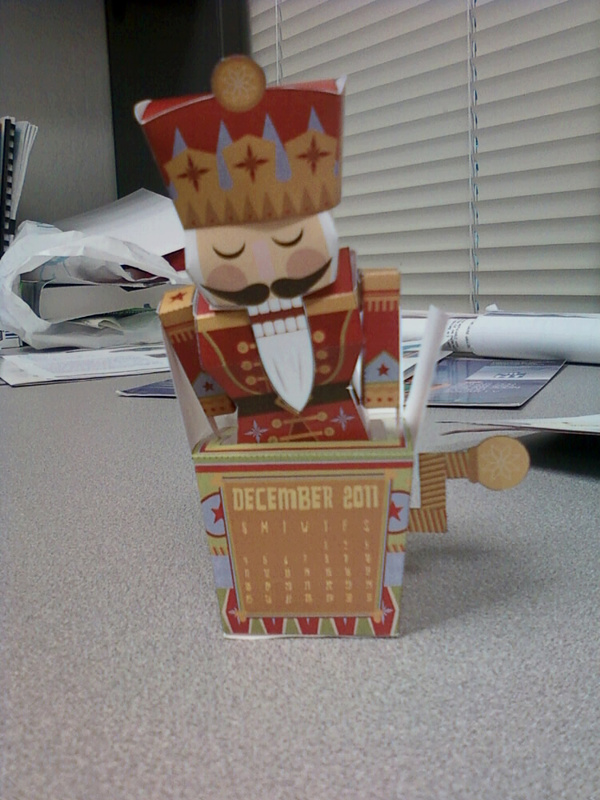 I am amused at how my jack-in-a-box nutcracker soldier guy is leaning over like he has fallen asleep while on the job. Ignore the mess behind him. Those are totally important papers that need to be in a prominent area. This is the December 2011 calendar from Go Scout Creative. how hot is hot glue?